Parking tickets ruled illegal | What Car? Thousands of motorists could have parking fines cancelled after a landmark legal ruling. The judgement says that councils must display warning signs when using mobile cameras to issue parking tickets. 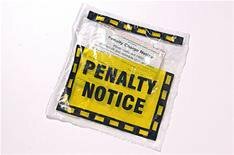 It is a legal requirement that signs reading 'camera enforcement in operation' should be displayed before penalties can be issued. The ruling could affect 32 local authorities that use the so-called 'spy cars'. The case was brought by off-licence manager Rachel Johnson, who had a parking ticket issued as a result of evidence gathered by a 'spy car'. Miss Johnson took her fight to a parking tribunal following an unsuccessful appeal to Wirral County Council. 'My car was parked for no longer than 10 minutes outside our shop, which is legitimate practice when dropping off cash or delivering heavy loads,' Miss Johnson said. Wirral Borough Council says it is 'reviewing' its use of spy cars.